An extraordinary collection of original portraits and views from French explorer Nicolas Baudin’s voyage of discovery in 1800-1804, including rare and significant depictions of pre-settlement indigenous Tasmanians, will be auctioned by Deutscher and Hackett, in association with Hordern House. Deutscher and Hackett director, Chris Deutscher, said the early portraits and views are the most startling collection of voyage art to come onto the open market in many decades. With a total auction estimate range of $4.0 m– $5.5m for the 13 works, new records are expected to be set for both drawings and watercolours produced in Australia from any period. 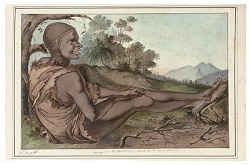 The works on paper by the two principal artists aboard Baudin’s ship Geographe, Nicolas-Martin Petit (1777-1804) and Charles-Alexandre Lesueur (1778-1846), are a remarkable on-the-spot record of the Indigenous inhabitants encountered in Western Australia (1801), Tasmania (1802) and New South Wales (1802). Previously unknown and un-recorded until being re-discovered recently in Paris, the works were held since the 19th century by a French family linked to the artists. Contemporary journals record how some of the works to be auctioned were shown to English explorer Matthew Flinders, when Baudin met up with Flinders in Encounter Bay, Tasmania in 1802. Besides the recorded collection at Le Havre in France, there are very few original works of art from Nicholas Baudin’s celebrated voyage of discovery held anywhere in the world. So, the existence of this recently discovered cache is an important and ground breaking moment in Australian art history . Founding director of Hordern House, specialist in rare books, manuscripts and artworks in Sydney, Derek McDonnell, said the works transcend simple voyage art. “Petit’s Tasmanian portraits are blazing comets in the known history of the Baudin voyage. The discovery of these additions to Petit’s oeuvre, particularly the Tasmanian portraits and depictions of Aboriginal people in Sydney is a cause for celebration – and Lesueur’s view of the Vasse in Western Australia and view of Port Jackson are extremely rare examples of his Baudin voyage drawings. The idea of Baudin and Flinders looking at the Tasmanian works as they rested in Encounter Bay in 1802 is a striking and quite moving thought,” Mr McDonnell said.